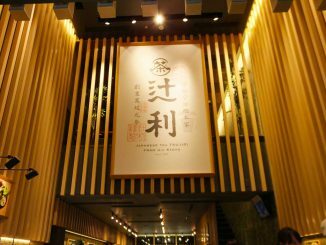 Why is Gyoganji Temple called ‘a temple of skin’? Do you know Gyoganji Temple near Kyoto Imperial Palace? 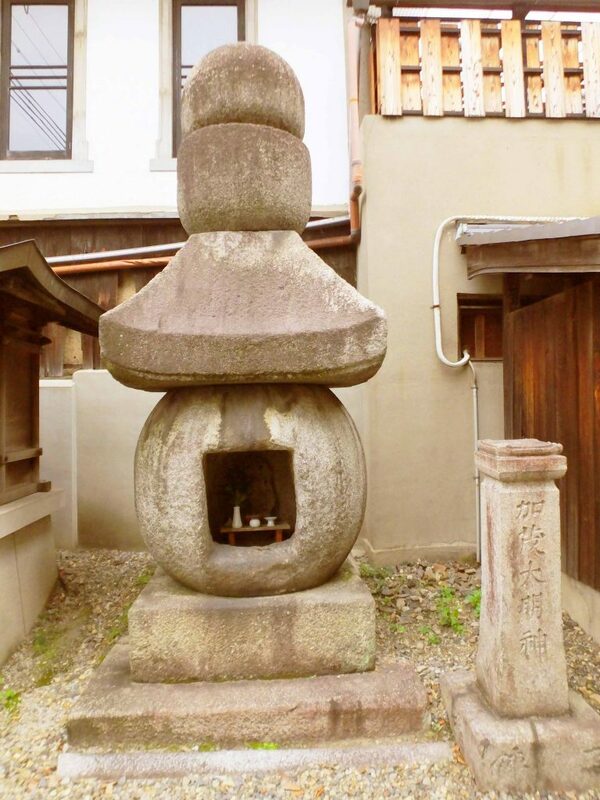 The temple is also called Kodo, meaning ‘a temple of skin’. There is a folklore about it. One day a hunter shot a female deer. With running blood, a baby deer came out of the womb split open, and the mother deer died soon. The hunter thought “What a horrible thing I did!” Then he decided to become a Buddhist monk. His name is Gyoen Syonin. Trying to keep in mind that he had been brutal, he always wore the skin of the dead mother deer. He was nicknamed Kawahijiri, meaning ‘a monk of skin’. This is why his temple has been called Kodo (a temple of skin). 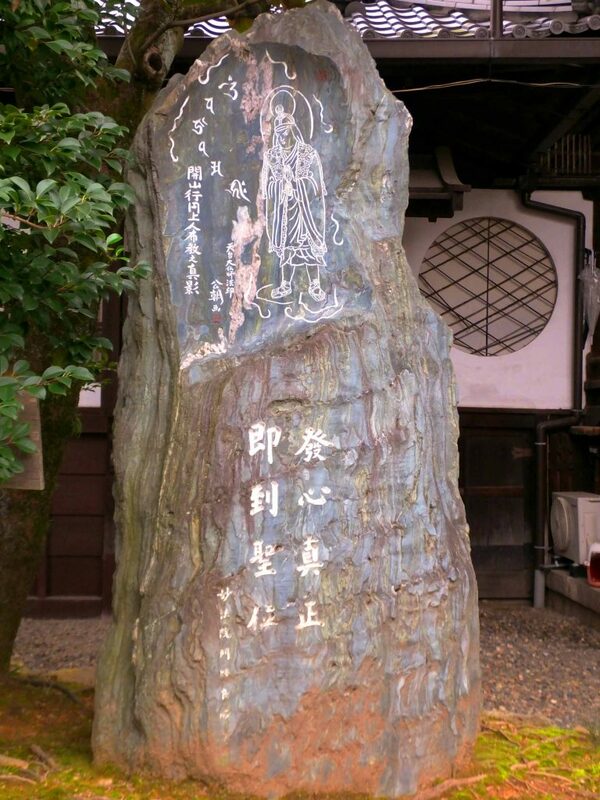 A stone monument in the temple shows you what Gyoen Syonin was like. 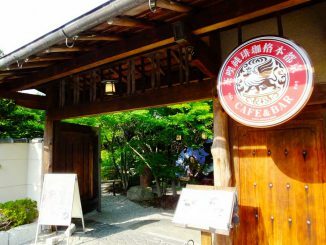 A girl named Fumi lived in a pawnshop near Gyoganji Temple to serve the shopkeeper. Every day, she babysat listening to a song of the temple. She learned the song by heart, and started singing it as a lullaby. Then the children came to be able to sing it, too. The shopkeeper was furious because his religious affiliation was different from the temple’s. One day the shopkeeper punished and killed her. Though he buried her in the garden, he told her parents that she ran away from there. The parents said sorry to him and prayed for her safety in the temple. Then she appeared as a ghost and told the truth to her parents. The parents felt pity for her and drew a picture of her on an ema (a votive wooden plaque). Her hand mirror was embedded in it, too. The ema has been called Yurei Ema. Yurei means ‘a ghost’. 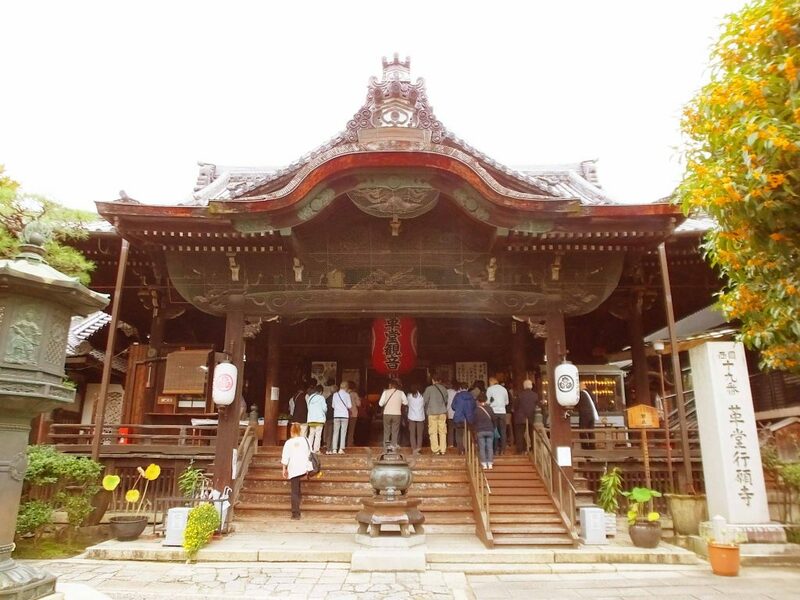 You can see Yurei Ema in late August every year when the temple holds a memorial service for Fumi. Taking pictures is not allowed, so go there and see it yourself. 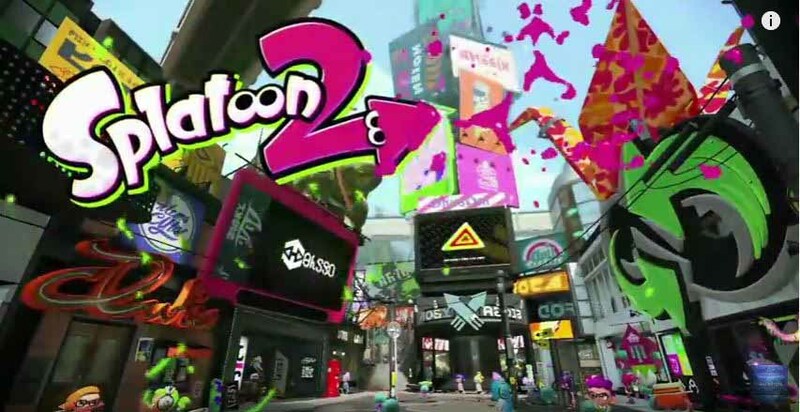 I went there in 2016. 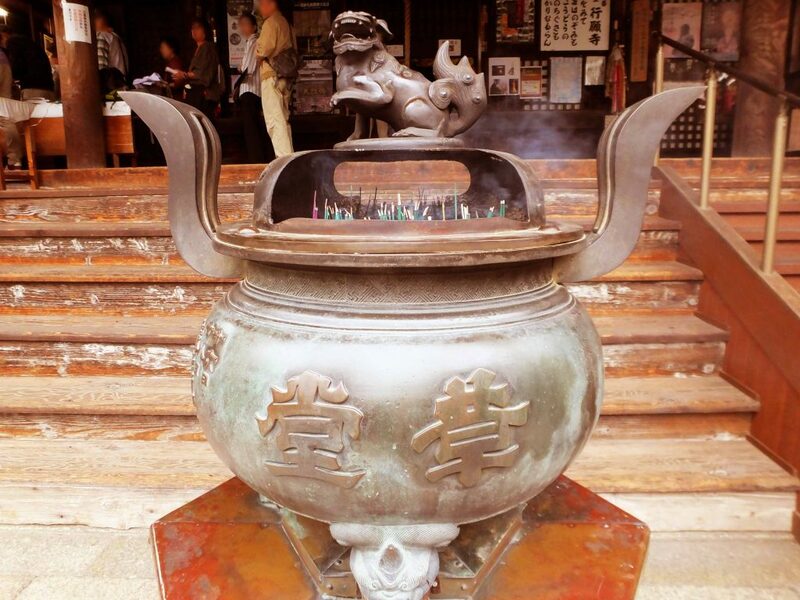 In front of the main hall, there is an incense burner. You can see Chinese characters of ‘Kodo’ meaning ‘a temple of skin’ on it. 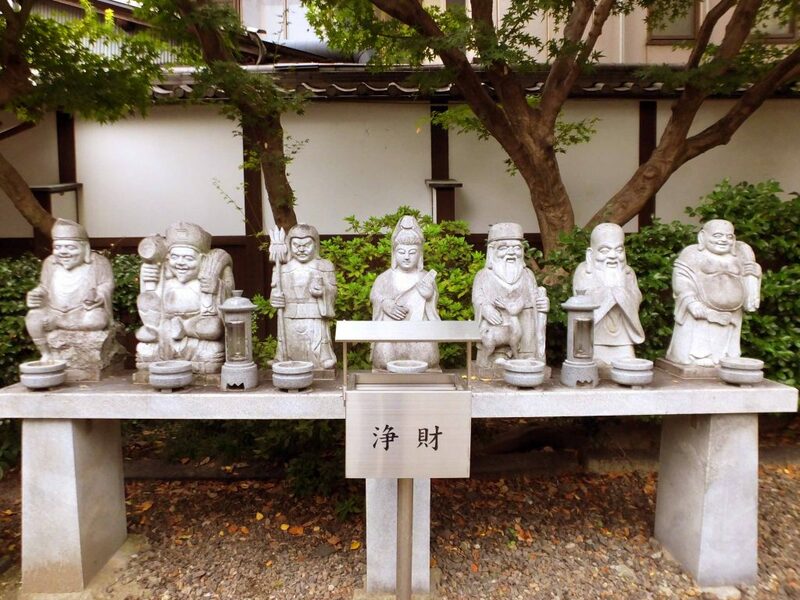 Near the main hall, there are small statues of Seven Deities of Good Fortune (Japanese: Shichi Fuku Jin) including a deity of longevity, Jurojin. He is often with a deer, and the deer symbolizes longevity, too. Can you see him? He is the third from the right. The belfry in the temple was built in 1804. When I went there, some cats were playing under the bell. I’m sure that they didn’t know the belfry had been there ever since more than 200 years ago. 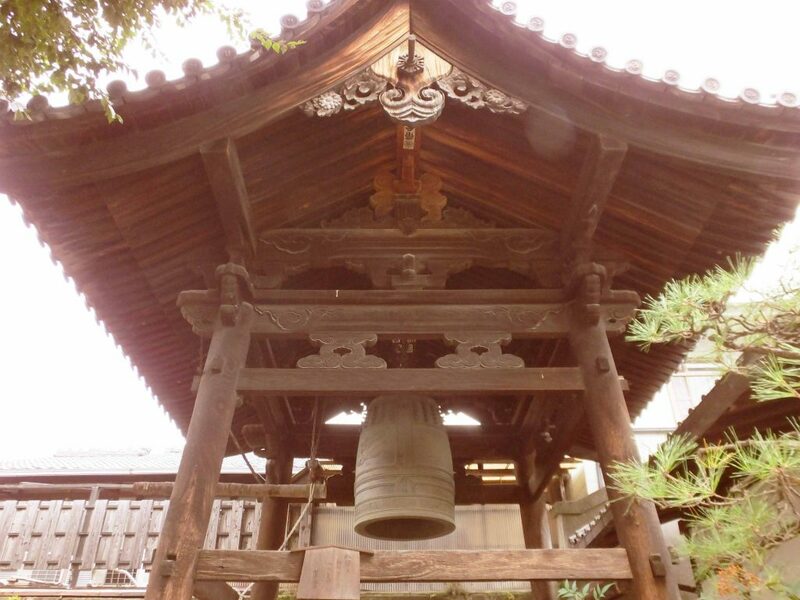 Next to the belfry, you can see a small stone pagoda called gorinto. 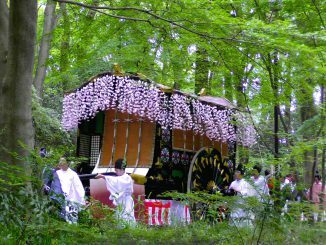 A deity of nature, Kamo Daimyojin is in it. Gorinto consists of five parts that symbolize nature. In order from the bottom, there are the hexahedron (meaning the ground), the sphere (water), the roof shape (fire), the hemisphere (wind) and the jewel shape (sky). There are many gorinto all over Japan.